This article is about the men's team. For the women's team, see Greece women's national basketball team. Basketball has a long tradition in Greece, as the country was one of the eight founding members of the International Basketball Federation, more commonly known by its French acronym FIBA, in 1932. However, the men's national team was considered as a second-class power in international basketball for several decades and only came into prominence in the mid-1980s by winning the EuroBasket 1987. It was the first ever major international title won by a Greek national team in any sports. As a result, basketball became extremely popular in the country and since then Greece has been placed in the high level on the basketball stage. Greece was to take part in EuroBasket 1935, the inaugural FIBA European Championship held in Geneva, but were not able to travel to Switzerland due to financial problems. Thus, Greece made their international debut fourteen years later in the EuroBasket 1949 in Cairo, Egypt. That tournament has been marked as the weakest in the history of the competition, as most of the leading European basketball nations at the time refused to travel by plane to Egypt. Greece entered the tournament as a newcomer and got through to make their first major success in their very first appearance in the competition, finishing in third place behind hosts Egypt and strong side France. After their first international success, the Greeks were also present in the following tournament in 1951, where they qualified to the semi-final round and finally finished 8th among the eighteen nations that participated. They also made their first appearance at the Summer Olympic Games, taking part at the Summer Olympic basketball tournament in 1952. They were narrowly eliminated in the preliminary round, finishing at the bottom of the classification along with other six teams, ending the first period in the history of the team as Greece did not enter any major tournament for the rest of the 1950s. During the 1960s, the 1970s and the first half of the 1980s, Greece appeared in most of the EuroBasket competitions, with their best performances being the 8th place in 1965 and the 9th place in both 1979 and 1981. They didn't manage to qualify for the Summer Olympic Games and the FIBA World Cup but in 1979 they managed to win the gold medal at the Mediterranean Games, beating Yugoslavia 85–74 in the final. Greek basketball legend Nikos Galis, FIBA Hall of Fame inaugural inductee and widely regarded as one of the all-time greatest players in both European and FIBA International basketball history. The history of the national team was not overly impressive until the mid-1980s, when Greece arose as the new power in international basketball spearheaded by top-class players Nikos Galis, Panagiotis Giannakis, Panagiotis Fasoulas and Fanis Christodoulou. The beginning was their qualification for the 1986 FIBA World Championship, for the first time in their history and the end of the tournament found them 10th among the twenty-four nations. In the next year, Greece faced up their biggest challenge, as the country was the host of the EuroBasket 1987 and the team enjoyed a formidable line-up. Qualified from the preliminary round, they eliminated Italy and Yugoslavia, both among the favourites to win the tournament, in the quarter-finals and the semi-finals respectively. In the final, Greece faced the defending champions and heavily favoured Soviet Union. In front of 17,000 Greek fans at the Peace and Friendship Stadium, the hosts won the gold medal after a thrilling win 103–101 over the Soviets, with Nikos Galis scoring 40 points. It was the first time that a Greek national team won a major tournament in any sports, thus basketball was made the national team sport overnight and the national team was to be considered the official cherished of the Greek nation. The European champions failed to qualify for the 1988 Summer Olympic Games for a first time in 36 years, despite a decent performance in the pre-Olympic tournament. In the EuroBasket 1989, the defending champions were under pressure to prove that they could stand at the top level of international basketball and they did so in a convincing way. After they had qualified from the group stage, the Soviet Union stood in their way in the semi-finals but Greece defeated them once again and reached the final. Contrary to what happened two years ago, this time Greece had to overcome Yugoslavia and the latter's home court advantage, as the tournament was held in Zagreb. Eventually, the Greek team bowed to the home side taking the silver medal, their third medal in total and second in a row. In the 1990s there was a series of successful results for the national team, which was present in all major international tournaments every year except for the 1992 Summer Olympic Games. In the period between 1990 and 1998, Greece never fell below 6th place and usually ended up 4th. They also qualified for a second Olympic appearance in 1996, where the team reached the 5th position. Ιn the 1990 FIBA World Championship, the team would face a new challenge as they would have to compete without their leading scorer Nikos Galis who was injured, but performed better than four years ago and were placed 6th. For the next two competitions in 1994 and 1998 Greece finished 4th. In 1994, the team reached the semi-finals but was eliminated by the United States and played for the third place against Croatia to which they lost and were placed 4th, a result that was considered to demonstrate the continued prominence of the team. In 1998, the tournament was held in Athens and the Greeks hoped to qualify for the final, but in the semi-final they were eliminated by Yugoslavia in extra time and their disappointment of missing the chance to reach the final led to an easy defeat to the United States in the bronze medal game, once more leaving Greece 4th. In the EuroBasket 1991 Greece finished 5th and for the next three competitions in 1993, 1995 and 1997 they reached the semi-finals but ultimately ended up 4th. The 1995 tournament was hosted in Greece but the Greeks failed to repeat the triumph of 1987 and were defeated in the semi-final by Yugoslavia, something that happened again in 1997, while hosts Germany had eliminated Greece in 1993. The years 1999–2002 were marked by an obvious decline of Greece. The beginning of this era was the shocking 16th and last place of the team in the final standings of the EuroBasket 1999, having suffered three defeats in the preliminary round. Consequently, Greece was absent from the 2000 Summer Olympic Games. In the next European championship in 2001, the Greek team was placed 9th, thus failed to qualify for the 2002 FIBA World Championship. Greece won the silver medal at the 2006 FIBA World Championship after their memorable 101–95 win against USA. The revival of Greece started in the EuroBasket 2003, where an overhauled team finished 5th; the experiment was partly successful but the public was not very enthusiastic. The 2004 Summer Olympic Games in Athens, were considered as the biggest chance of hosts Greece to win their first Olympic medal, but a close loss (69–64) to eventual gold medalists Argentina in the quarter-finals, stopped their way and they were finally placed 5th. Greece were considered a strong outsider for the medals at the EuroBasket 2005. They advanced from the group stage with two wins in three games and eliminated Israel and Russia to reach the semi-finals, where they faced France. The French were leading the score by seven points with only one minute left, Greece appeared to have no chance to pull out the win and one more lost semi-final was coming. However, the Greeks managed to get within a two-point distance and won 67–66 with a three-pointer by Dimitris Diamantidis with three seconds remaining, setting off a joyous celebration from the Greek side. At the final and in front of a raucous pro-Greece sold-out crowd of 20,000 at the Belgrade Arena, the Greeks defeated Germany in a convincing way with 78–62 and won the gold medal for a second time in their history. 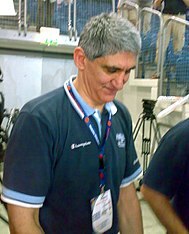 Greek basketball legend Panagiotis Giannakis is the only person to have won the EuroBasket both as a player (EuroBasket 1987) and as a head coach (EuroBasket 2005). 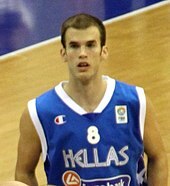 He also led Greece to the final of the 2006 World Championship. The following year, the European champions won the 2006 Stanković Cup going undefeated in the tournament and defeating Germany again at the final with an impressive 84–47 win. In the 2006 FIBA World Championship, Greece were glazed to win a medal that had closely missed in their last two appearances in the tournament and reached once more the semi-finals with a record of seven consecutive wins, some of them impressive. In the semi-finals, Greece defeated the popular odds-on United States in a 101–95 upset, rallying back from twelve points down, and qualified for the final, but they proved to be exhausted from their dramatic game with the Americans and lost 70–47 to Spain, ending up with the silver medal. Despite the loss the players were greeted enthusiastically by celebrating fans on their return to Greece, due to their first medal in a World Championship and their glorious win over the United States. In the EuroBasket 2007, the defending European champions advanced to the semi-finals where they faced up hosts and world champions Spain, in a repeat of the final one year ago. Greece came close to take a revenge but finally lost 82–77 and played in the bronze medal game, where they succumbed to Lithuania. At the 2008 Summer Olympic Games, another last-second defeat 80–78 to Argentina in the quarter-finals led Greece to the 5th place more. 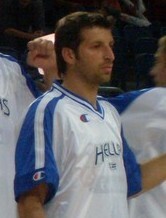 In the EuroBasket 2009, the national team was potently changed; with a bunch of young players and without key players Theodoros Papaloukas and Dimitris Diamantidis, as well as Panagiotis Vasilopoulos and Kostas Tsartsaris, the tournament was perceived as the turning point for Greece after their major recent achievements. However, after their fourth consecutive defeat to Spain in the semi-finals and sixty years after their first, and last, bronze medal they managed to take the podium in the third position against the odds, with a thrilling 57–56 win over the Slovenia, ceasing the curse of being defeated in all bronze medal games in their history. Before the 2010 FIBA World Championship, the team exhibited impressive performances during friendly preparation matches, beating Germany 82–54, Russia 101–63, Croatia 90–81, Canada 123–49, Slovenia 96–72, and Serbia 74–73, in a game that ended up in a brawl. That brawl exposed problems within the team, which showed a different face in crucial matches in the World Championship. In the group stage, Greece lost to Turkey and Russia, (being accused of purposely losing the game with Russia, to avoid playing with Spain in the knock-out stage). France's loss to New Zealand meant that Greece had to face Spain anyway in the phase of 16. The two teams met once more, in a dramatic game that Spain won in the last minutes (a game that lead to Greek complaints about critical referee calls). That loss meant that the Greek team was eliminated from the next stage, ending up 11th (its worst performance in a World Cup). That game led to the fifth consecutive Spanish victory over Greece in major international competitions (Greece would stop Spain's winning streak 3 years later at EuroBasket 2013, beating them 79–75, with Vassilis Spanoulis scoring 20 points). That actually represented a reversal of the previous situation, as Greece had previously defeated Spain in every game they played against each other at the four major international competitions (1990 FIBA World Championship, EuroBasket 1993, EuroBasket 1995, and the 1998 FIBA World Championship). After the elimination in the 2010 FIBA World Championship, Dimitris Diamantidis announced his retirement from the national team, at age 30. During preparations for EuroBasket 2011, new head coach, Ilias Zouros, faced one of the greatest challenges in the history of Greek basketball team, with the absences of no less than 9 key players (including star players: Dimitris Diamantidis, Theodoros Papaloukas, Sofoklis Schortsanitis, and Vassilis Spanoulis). Zouros had to assemble a team mostly made of young players (half of the team's players had never participated in the EuroBasket), with little time to prepare. The new national team, featuring some of the next generation Greek players ("Generation X"), exhibited promising signs during friendlies, beating Russia 83–80, Germany 69–56, and Turkey 62–38. At the EuroBasket, Greece managed to reach the quarterfinals, where it lost to eventual finalist France (64–56). Subsequently, victory against Serbia (87–77), and a loss to Lithuania (73–69), led Greece to 6th place, thus securing participation in the 2012 FIBA World Olympic Qualifying Tournament. At the 2012 FIBA World Olympic Qualifying Tournament, Greece failed to qualify for the Olympics, after an 80–79 loss to Nigeria. Participation in the EuroBasket 2013 with its new head coach, Andrea Trinchieri, didn't bring any consolation to its fans. The team, once more exhibited superb performance during preparation games (including scoring commanding victories against both eventual finalists France and Lithuania) earning the top spot on the FIBA EuroBasket power rankings before the tournament. Their start in the EuroBasket was equally fruitful, with comfortable victories against Sweden (79–51), Russia (80–71) and Turkey (84–61). However, serious injuries plagued the Greek team (Spanoulis, Mavrokefalidis, Papanikolaou, Zisis) and despite the impressive win against the defending Champions Spain, losses at critical games (especially those against Italy and Finland in Group stage 1), lead to failure to reach the quarterfinals for the first time since the EuroBasket 2001. They were, however, selected as a wild card for the 2014 FIBA Basketball World Cup, being placed in Group B consisting of Philippines, Senegal, Argentina, Croatia and rivals Puerto Rico. The team once more had a new head coach, Fotios Katsikaris, and once more faced what had become a chronic problem of missing key players (this time Vassilis Spanoulis, Kosta Koufos, Antonis Fotsis, Stratos Perperoglou and Sofoklis Schortsanitis). Greece ended up first in its group, after defeating all the above teams (being, along with USA and Spain, one of three undefeated teams in the Group Stage), but lost to Serbia in the Round of 16, and ended up in ninth place overall. Greece participated in EuroBasket 2015, in the Group C consisting of Netherlands, Croatia, Slovenia, Georgia and rivals Republic of Macedonia. The team, with Fotios Katsikaris as head coach, ended up first in its group, after defeating all the above teams (being, along with France and Serbia, one of three undefeated teams in the Group Stage). In the Round of 16, they defeated Belgium (75–54), but in the quarterfinals, they lost to Spain (71–73). Two days later (17 September 2015), they defeated Latvia (97–90), ending up in fifth place overall, and qualified to one of the three 2016 FIBA World Olympic Qualifying Tournaments. At the 2016 Turin FIBA World Olympic Qualifying Tournament, Greece defeated Iran (78–53), and Mexico (86–70), but lost to Croatia (61–66), and failed to qualify to the Summer Olympic Games, for the second time in a row. However, they qualified for EuroBasket 2017. Greece began the EuroBasket 2017 with a victory against Iceland, but lost their next three games against Slovenia, France, and Finland. However, they defeated Poland, by a score of 95–77, to clinch a spot in the single elimination rounds. In the round of 16, Greece made a strong performance to defeat Lithuania, by a score of 77–64, and advanced to the quarterfinals, where they lost to Russia, by a score of 74–69. Roster for the 2019 FIBA Basketball World Cup qualification (Europe). He is the only person to win the EuroBasket, both as a player (EuroBasket 1987), and as a head coach (EuroBasket 2005). Note: Includes only games played that are classified as being games played under the category of Greek senior men's national basketball team games, as deemed by the Hellenic Basketball Federation. Players in bold, are players that are still active. Last updated: 3 October 2018. ^ Greece trounces Canada 123-49 at Acropolis event. ^ "Eurobasket History – The 30s". EuroBasket2009.org. Retrieved 9 September 2009. ^ "Eurobasket History – The 40s". EuroBasket2009.org. Retrieved 9 September 2009. ^ "Eurobasket History – The 80s". EuroBasket2009.org. Retrieved 9 September 2009. ^ "EuroBasket History – The 21st century". EuroBasket2009.org. Retrieved 11 September 2009. ^ "Greece at the FIBA Basketball World Cup 2019 European Qualifiers 2019 - FIBA.basketball". FIBA.basketball. Retrieved 2018-09-28. ^ "Σκουρτόπουλος: "Μια πολύ σοβαρή Εθνική"". basketa.gr (in Greek). 2018-11-26. Retrieved 2018-11-27. Wikimedia Commons has media related to Greece national basketball team.